Due to excessive traffic along Hwy 90 during the “Cruisin’ the Coast” events, October 1-6, 2018, we anticipate major delays on some of our CTA routes. 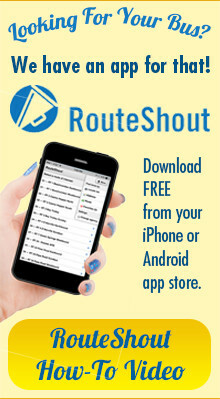 CTA will do everything possible to run as close to our regular scheduled times listed in our route guide. The following routes and schedules have been altered to provide continued services during this week long event. Wednesday & Thursday, October 3 & 4, Beachcomber Routes will end at 7:20 pm at Edgewater Mall. Friday & Saturday, October 5 & 6, Beachcomber Routes will end at 12:35pm at Edgewater Mall. 8:30am – 5:30pm – No Service to Treasure Bay Bus Stop in Parking Lot, pickup/drop off location on Hwy 90. 8:30am – 5:30pm – No Service on Westbound Beachcomber Edgewater Village. 8:30am – 5:30pm – No Service along Automall Parkway, D’Iberville. 8:30am – 5:30pm – No Service on Washington Ave and Government St west of MLK Blvd. Ocean Springs. 8:30am – 9:00pm – No Service on Washington Ave and Government St west of MLK Blvd. Ocean Springs. Coast Transit Authority will make every effort to run on schedule. Due to Extremely Heavy Traffic along Hwy 90 and Pass Road, especially during the PM Hours, all routes could experience major delays and/or cancelation of some trips. CTA will be monitoring the traffic conditions and provide updates when they become available. Please plan your travel accordingly or earlier in the day whenever possible. Riders are encouraged to pre-plan your trip accordingly. We apologize in advance for any inconvenience and thank you for your cooperation. For additional route information contact CTA at 896-8080 or visit us at www.coasttransit.com.